The Great Salt Lake isn’t known for good fish ing–and the Dead Sea isn’t exactly ringed with willows. Freshwater flora and fauna don’t thrive in salty solutions. So the threat of salt water intrusion in the Everglades National Park has a lot of people worried. Water is a major issue in south Florida these days. As more people migrate to the area, demand for dry land and fresh water increases. Developers have drained marshy lands and built canals to route water away from its natural courses. Since the region is flat and lacks natural reservoirs, drinking water has been pumped out of the ground. 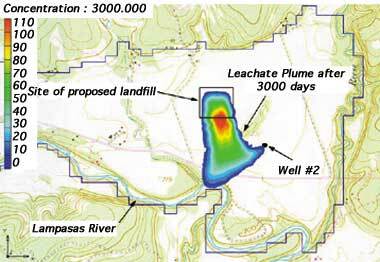 This image used in a training program shows how GMS might predict the spread of contaminants from a proposed landfill. One result of these growth-related measures is salt water intrusion. As fresh water is removed from the land, seawater seeps in to replace it. The Everglades are growing saltier–and increasing salinity presents a huge range of ecological problems. The Army Corps of Engineers manages all U.S. waterways; with national park employees, they are working to protect and restore the Everglades. And when Army researchers tackled the south Florida problem, their tool of choice was a system of water modelling software developed primarily at BYU. Norman L. Jones, an associate professor of civil and environmental engineering, directs BYU’s role in the government-funded project. “Our motivation in building the system was to develop a visual model that would aid in the cleanup of groundwater contamination,” he says. First released in 1994, the Department of Defense Groundwater Modelling System (GMS) is now used by some 2,500 governmental and commercial organizations in more than 55 countries around the world. Cary A. Talbot, a research hydraulic engineer at the Army Corps of Engineers Waterways Experiment Station in Vicksburg, Miss., says the research effort was initiated to help clean up contaminated military sites. For help in evaluating its more than 10,000 contaminated sites, in 1993 the Army enlisted Jones, who had done related work during his PhD program. Jones and his colleagues created a graphical user interface that allows scientists to build three-dimensional animated computer models of groundwater flow, helping them track the movement of contaminants. Analysts enter data collected at key locations around a site, and the software helps them forecast the flow of groundwater or estimate the extent of existing contamination. “A groundwater model can also help you make decisions concerning which cleanup technique to use,” Jones says. Groundwater contamination is typically addressed by using bacteria to consume spills of organic contaminants, like gasoline, or by pumping out contaminated water and flushing the soil with clean water. GMS allows researchers to design and test different clean-up scenarios, Jones says. The system can help scientists determine the optimal conditions for growing spill-eating bacteria; or, if flushing is needed, the system can predict the effectiveness of various well locations and pumping rates. GMS continues to be refined and applied to a widening range of locations and problems. The ongoing development process keeps Jones and his team very busy. BYU professors also produced and maintain two related computer modelling systems used at the Waterways Experiment Station: the Surface Water Modelling System (SMS), for analyzing things like rivers and harbors; and the Watershed Modelling System (WMS), for modelling things like runoff and flooding. Alan K. Zundel, an assistant professor of civil and environmental engineering, directs SMS research; Jim Nelson, also an assistant professor of civil and environmental engineering, is responsible for WMS. All three BYU-created systems are user interfaces that plug in to other, more specialized codes. The codes are the products of several government agencies and about 20 other universities, but programmers at BYU combine all the technologies into a user-friendly package, Talbot says. BYU also creates training materials and reference manuals for the systems. Though the modelling systems began as an effort to help clean up contaminated military sites, they have many other applications. “It’s being used right now to model the complex relationship between surface water and groundwater,” Talbot says of the systems’ use in south Florida. “There’s a big problem when you try to marry up those two computational worlds. “For example, surface water in canals is a one-dimensional problem. But when it rains and water is flowing over the land, it’s a two-dimensional problem. Once it gets into the subsurface, it’s a three-dimensional problem. GMS is the only tool available where we can build one-, two-, and three-dimensional models using the same piece of software and have the results talk to each other,” Talbot says. The modelling systems have also been used to answer questions about waste management, emergency planning, and mining. Will a proposed landfill endanger the city’s water supply? GMS can identify potential problems. If a local dam breaks, whose land will be flooded? A floodplain delineation map created with WMS can provide answers. Finally, if enough water is pumped out of the ground so that a huge body of ore buried 2,000 feet deep can be dry mined, how will that affect nearby lakes and wetlands? The problem is still being studied. Jones and his colleagues are watching their work have broad impact not only in the United States but around the world. For example, groundwater experts at the Center for Environment and Development for the Arab Region and Europe are using GMS to help Egypt, Libya, Sudan, and Chad develop the Nubian Sandstone Aquifer–a 25,000-year-old natural reservoir–which holds a 100-year supply of water for cities in North Africa. Governments in Europe, Asia, Africa, and South America now use GMS to deal with water resource issues and environmental cleanup. Another of the system’s current applications is the classroom. In Jones’ new “Ground Water Modelling” class, engineering students use GMS to analyze data gathered in East Woburn, Mass., and build cases for and against two companies accused of contaminating the city’s water supply. The students create computer models and present their findings as if they were expert witnesses in the courtroom.